Photo Source: AP Photo/GeoEye/SIME; Iran’s Nuclear Program (Nuclear Talks, 2012), New York Times, April 9, 2012. On Friday, in Istanbul, Turkey, previously scheduled negotiations between Iran and world powers, which are the United States, China, Russia, and key European nations, will take place. 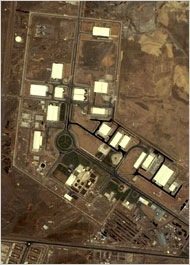 As many are aware, the dispute with Iran concerns Iran’s nuclear program, its levels of uranium enrichment, and whether those levels are reaching weapon grade levels. Iran’s nuclear program is one of the most polarizing issues in one of the world’s most volatile regions. While American and European officials believe Tehran is planning to build nuclear weapons, Iran’s leadership says that its goal in developing a nuclear program is to generate electricity without dipping into the oil supply it prefers to sell abroad, and to provide fuel for medical reactors. Iran and the West have been at odds over its nuclear program for years. But the dispute has picked up steam since November 2011, with new findings by international inspectors, tougher sanctions by the United States and Europe, threats by Iran to shut the Strait of Hormuz to oil shipments and Israel signaled increasing readiness to attack Iran’s nuclear facilities. Fears of an attack on Iran have driven up oil prices and represent a threat to the already fragile state of a global economy still reeling from a sovereign debt crisis in Europe. At the same time, the Iranians have acutely felt the squeeze from a round of sanctions aimed at getting Iran to freeze its uranium enrichment program. In March 2012, the global powers dealing with the program announced that they had accepted an Iranian offer to resume negotiations that broke off in stalemate more than a year before. Talks were set to begin in Turkey in mid-April, with both sides jostling for advantage in the days running up to the negotiations. American and European diplomats said that one demand from the Obama administration and its allies would be a halt in the production of uranium fuel that is considered just a few steps from bomb grade, and a stop to the shipment of existing stockpiles of that fuel out of the country. . . . Ahead of the scheduled negotiations, however, Iran’s nuclear chief Fereidoun Abbasi is suggesting the possibility of compromise between Iran and world powers. As concerns Iran’s nuclear program, Abassi is suggesting that Tehran may be amenable to stopping its uranium enrichment process at the threshold of 20 percent, which is below a weapons grade level. The 20 percent level is significant because that is the threshold amount necessary for a research reactor. Abassi also suggested that Iran could continue to enrich uranium at an even lower lever for power generation.